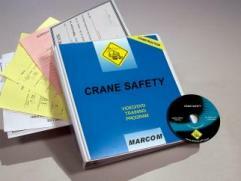 MARCOM's Crane Safety in Construction Environments DVD Program points out to employees that over 90% of crane-related accidents are caused by human error... and that they are the key to preventing these incidents. While there are many different types of cranes, they all have the ability to make many jobs much easier by lifting enormous weight. But they also share the potential for disaster when they are not operated safely. Crane-related accidents can often be deadly, due to the cumbersome and heavy loads that are lifted. A small miscalculation, or a brief moment of inattention, and tragedy could strike. Once a load falls, not much can be done to stop it, and there is little time for people to move safely out of the way. A coworker could be injured or killed, and expensive equipment or materials could be damaged or destroyed... even the crane itself. The DVD program includes information on recent changes in the OSHA regulation, operator certification, equipment inspection, hazard assessment, boom cranes, jib cranes, overhead cranes, general and operational safety devices, crane operations, hand signals, working around power lines, and more. The DVD program comes with a comprehensive leader's guide, reproducible scheduling & attendance form, employee quiz, training certificate and training log. The DVD versions of the programs are divided into 2 or 3 minute chapters, so the programs can be shown in their entirety in a single session, or individual chapters can be used as the basis for a number of 10 to 15 minute Tailgate Meetings or Toolbox Talks.